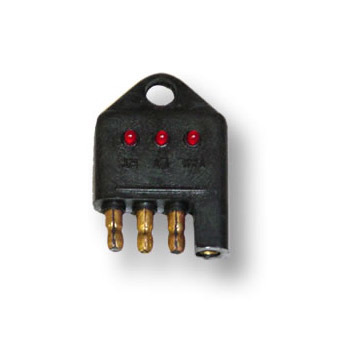 Our pocket-size, 4 Pole RV Output Socket Tester is an essential tool for any shop doing trailer hitch, trailer light connections and or installations. This handy rv output socket tester easily allows you to pinpoint the lighting problem, so when the customer says ‘the trouble’s not my truck, it’s your trailer’ – show him! The 4-Pole RV Output Socket Tester will test the output on the towing vehicle’s lighting plug. Pocket-size – weighs only a few ounces. An essential tool for shops doing trailer hitch and trailer light connections and or installations.